It is that time of the year again. The NBA Playoffs will begin Saturday, April 13th. Both Eastern and Western Conferences will present an action-packed first round that is sure to give us many headlines. Sixteen teams will start the playoffs, but only eight will advance. Who will emerge from each match-up. Lets take a look at each series, beginning with the Eastern Conference. The Bucks enter the playoffs as the number one team in the NBA. They are the only team who reached 60 wins in the regular season. The Pistons were able to wrestle the eighth seed away from the Charlotte Hornets despite struggling down the stretch. The Bucks swept the regular seasons series against the Pistons, winning all four games. The Bucks will continue their dominance over the Pistons. The Pistons do not have the offensive firepower to keep up with them. Despite the Celtics dropping to the fourth seed, many expect them to reach the Eastern Conference Finals. The Pacers have stayed afloat after losing all-star Victor Oladipo for the season. They enter the playoffs with the best overall defense in the NBA, giving up a league-low 104.7 points per game. The Celtics and Pacers will go back-and-fourth but the Celtics will pull it off. Kyrie Irving will shine in his first postseason action in a Celtics uniform. The 76ers are the dark horse of the East. They have the roster talent to compete for the crown. The Nets scratched and clawed their way to the postseason, making their first appearance since 2013. The two teams split their regular season series at two games apiece. This is an even match-up. Both teams are close to each other in almost every major statistical category. But, the 76ers have experience on their side. Not having all-star center Joel Embiid will hurt, but they will still pull it off. Once again, the Raptors enter the postseason with high expectations. This time, they are led by Kawhi Leonard, who has championship pedigree. The Raptors rank in the top ten in overall offense and defense. The Magic are back in the playoffs for the first in seven years. All-star Nikola Vucevic led the Magic all season long, finishing with a double-double (20.8 ppg 12.0 rpg). The Raptors are clearly the better team. They will run through the inexperienced Magic in their quest to prove themselves worthy of a title. The Warriors are set to defend their crown. They have the same major key players from last year’s run. Also, DeMarcus Cousins will play in his first playoff series in his career and will be ready. The Clippers earned a playoff spot despite not having a superstar player. Their offense is ranked fifth overall in the NBA, averaging 115.1 points per game. The Warriors are a different team in the playoffs. Their chemistry was tested all season long but this team always click at the right time. Both of these teams struggled in the first half of the season but found their footing in the second half. Both teams are near each other offensively and defensively. The Jazz are sometimes forgotten. They were among one of the best teams last year and has quietly crept into that conversation this year. The X-factor will be point guard Chris Paul. If he plays will and stays healthy, the Rockets can go deep in the playoffs. He will prove to be key in this round. Also, the Rockets have James Harden. Like the Jazz, the Blazers are a quiet team who often gets overlooked. 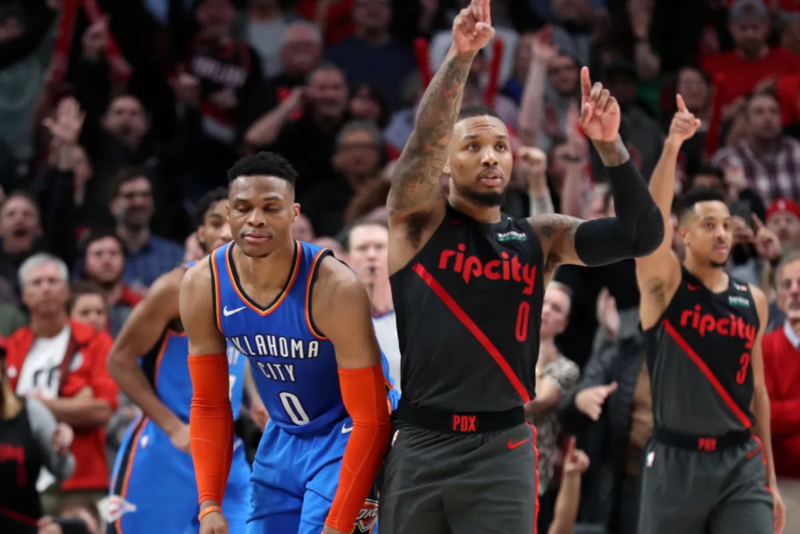 They have one of the best offenses in the NBA and one of the most dynamic back-court duos in Damian Lillard and C.J. McCollum. But, they have not fared well against the Thunder. The Thunder are 3-0 against the Blazers in the regular season. Plus, Paul George has improved from last season. He is in the conversation for MVP. The Thunder are the better team with the better talent. The Nuggets are arguably the most surprising team in the NBA. They have stayed near the top of the Western Conference all season long. Nikola Jokic meteoric rise has spread throughout their roster. The Spurs are back in the postseason. They have fought all season long. All eyes will be on DeMar DeRozan, who looks to erase his postseason blunders. This is a favorable match-up for the Spurs. The gritty, veteran status can bother the Nuggets. But, they do not have the same team like years past. The Nuggets have the hunger. They will prove, at least in the first round, they are not flukes.